The world’s first live production switcher for broadcast, professional and AV users with HDMI and SDI inputs, multi view, talkback, DVE, audio mixer, flash media players and more. ATEM Television Studio HD is the first live production switcher designed for both broadcasters and AV professionals. It includes 4 SDI and 4 HDMI inputs so you can connect up to 8 sources, and it supports all formats up to 1080p60. Packed with high end broadcast features, ATEM Television Studio HD has re-sync on all inputs so you always get clean switching whether you’re using professional or consumer cameras. Plus, you get multi view output so you can see all of your sources, preview and program on a single screen, aux out, built in talkback, 2 still stores, an audio mixer, camera control unit and more. ATEM Television Studio HD is perfect for live production, episodic television, web shows, AV or even live coverage of video gaming competitions. Simply plug in your cameras, game consoles or computers and start switching live. ATEM Television Studio HD is the fastest and most affordable way to create incredible HD programs immediately from live event. 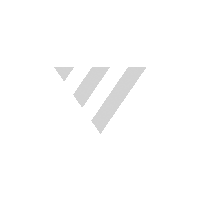 It’s perfect for broadcasters, professional sports, concerts, seminars, or even the new emerging generation of web broadcasters using platforms such as YouTube Live, Facebook Live and Twitch.tv. You can switch between multiple cameras, game consoles and computers in real time, all with broadcast quality transitions, graphics and effects. ATEM Television Studio HD features clean professional switching so there’s never a glitch when changing sources. That means you can even use it as a front end controller for your AV system and switch between multiple sources with the press of a button. 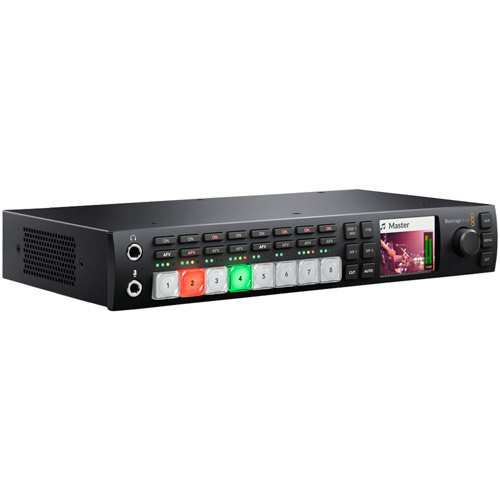 ATEM Television Studio HD lets you mix audio from any source or device plugged into any of the switcher’s inputs. You can mix your camera audio together with audio from other HDMI sources like computers and gaming consoles, along with the audio from the analog XLR inputs. You can fully mix audio right from the front panel, or you can use the audio mixer control tab on your Mac or PC to get a complete on screen, multi track mixing interface with level meters. Easily direct camera and external audio with precision level and balance adjustments, quickly enable and disable channels, or set audio to automatically follow the video source. Get full control of your cameras right from the ATEM software control. The Blackmagic Studio Camera can be controlled via the SDI program feed to the camera, so you can control its built in camera settings and full color corrector, all remotely from the ATEM software control panel.There are two types of control interface, a CCU layout for traditional camera control style, or a color corrector interface which is the same as DaVinci Resolve’s primary color corrector so you can use all your color correction skills from DaVinci Resolve for adding incredible creativity to live production. ATEM Television Studio HD fits in ? of a rack width so you can mix and match additional equipment in a smaller space. 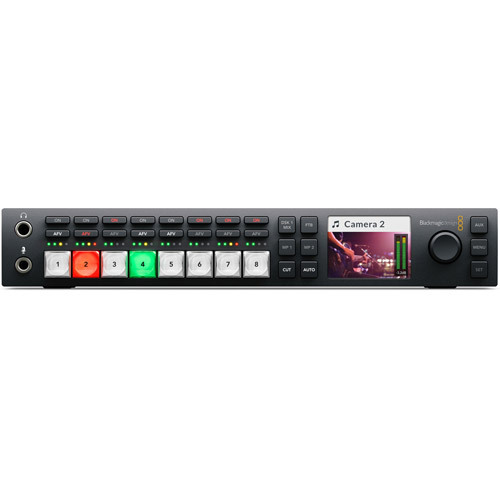 For example, you could rack mount ATEM Television Studio HD and use the free space to add a HyperDeck Studio Mini as a master recorder all in a single rack unit. You could even add Teranex Mini converters to convert additional sources between SDI and HDMI. Combine it with the Blackmagic SmartView 4K for an ideal multi view monitor, and even add a Blackmagic Duplicator 4K that lets you simultaneously record your program to 25 SD cards at the same time, so you can sell them to customers at the end of the event.